Its been a while since the last update, so I figured I’d give one even though its just a progress report. The Large Italian ships are well underway, and I’m just working on individual pieces of detail. The first game was four MAS Boats vs four T-14 boats. It was a complete massacare for the T-14s, with only one MAS being taken sunk. Even though the two types are equal in points, the lower hull values of the T-14s really hurt them, and its almost like they’re paying a premium for their Long Lance Torps which have no use in a boat vs boat brawl. Probably better to have a 3:2 ratio of T-14s:MAS. 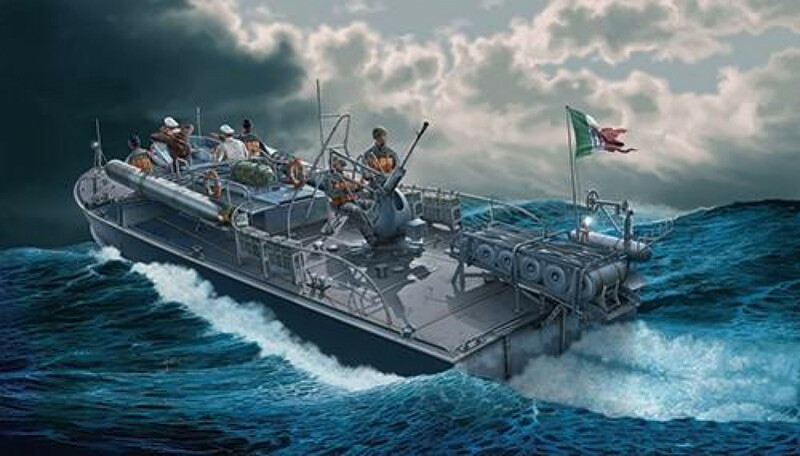 In the Invasion scenario, the Italian had a Gabbiano and two MZ Motozattera as the invasion force, escorted by two MAS Boats, and the Japanese were defending with a Hei Minesweeper and three T-14s. I know the scenario says Siebel Ferries, but I figured that the lower speed of the MZ Motos (they’re slower than a wet weekend) should counter their higher HP number in terms of the scenario. But the game was a wash, again for the Italians. The first shot from the Gabbiano took out the Hei’s Fire Director, meaning that the ‘sweeper’s gunnery was affected for the rest of the game. The MAS Boats then ran straight forward and launched their torps at mid range, only for the minesweeper to slightly misjudge its turn in – one torp scraped its starboard quarter and skimmed off (missed) and the other hit the ‘sweeper right on the bow. The Hei somehow survived the hit (2HP left over), but it was finally sunk when the same MAS Boat that that launched the torps gave it a drive-by with its machine guns. The T-14s did manage to get a couple of torps off at the Gabbiano, but the only one that actually hit…was a dud. So, in the end, the entire Japanese flotilla was…basically…taken out by…two MAS Boats…basically. 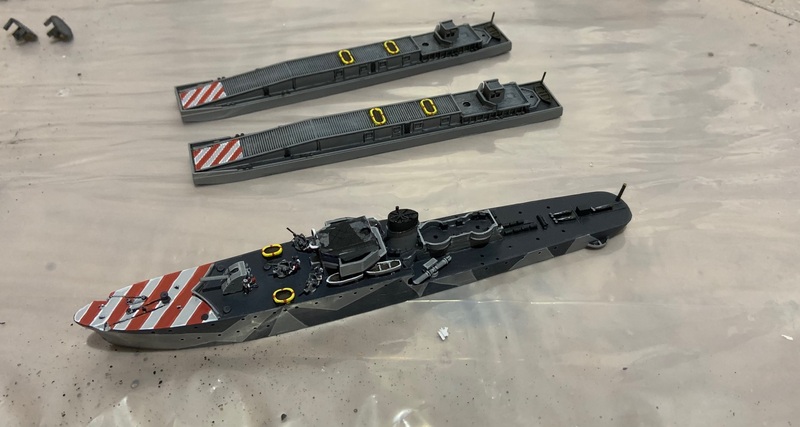 When I first saw the starter sets for each of the nations, the Italians caught my attention immediately – I suppose it can also be somewhat for my liking of the Italians in Dystopian Wars, but the Gabbiano Corvette just grabbed my eye immediately. And reading the flotilla list just cemented my liking of them…even if they basically define the term “glass cannon”. As with the Germans, the first step were some standard troops – the dog…sailors, the boat with only numbers. And for the Italians, those were MAS boats. I was surprised to see them in full metal – I thought Warlord would at least have the hulls in resin, as metal ones would tend to chip if stored incorrectly. Still, they were relatively, quick to paint up, with the only real complicated part being the aerial recognition markings. These boats won’t be the last ones I paint – I’m planning on having 6 MAS Boats, and maybe 8, backed up by a pair of CRDA 60t’ers. Although the latter haven’t been shown yet, some recent reveals of German R-Boats having been completed makes me think they’re not far away. So, starter set recieved. Probably most of what I need for now, although a couple of CRDA 60t’ers would be nice. 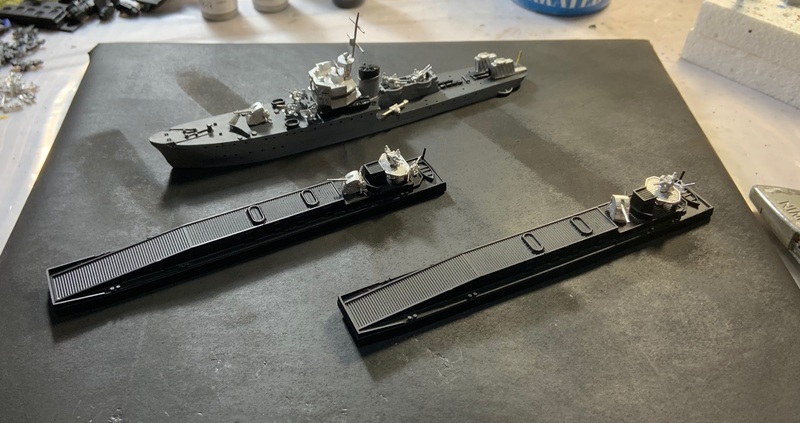 Probably look at getting these painted up in the immediate future and maybe expand to another Landing Craft and the CRDAs later…that should give me enough boats to do most of the scenarios. The Italian have one of the shortest lists in the Cruel Seas rulebook – its tied with the Russians if you consider the three Bronekater variants as one entry, and it is the shortest list (8 entries vs 10) if they’re considered separately. This makes considering lists and collecting somewhat easier than others, since you don’t have many options, but it also limits what your lists can do. Collecting the Italians at the moment are a little easier – they only have their starter box, and that actually has some good stuff in it. The four MAS boats are comparable to early Brit Vospers and faster to boot, and the Gabbiano Corvette is the reason I liked the look of the Italians in the first place. The other items in the box are also useful additions, although the F-Lighter is going to the Germans for their use (which is somewhat ironic, since, historically, it was the other way around!). The way I’m seeing it is that the MAS Boats will be the primary striking force of the flotilla, backed up by the CRDA 60s as a “Heavy” unit, and the MZ Moto for long range fire. I’ll also have to rely in the faster speed of the MAS Boats to keep them alive, since they’re tied as the lightest MTB in the game – I dread how the Russians will work with their slow-a** line boats. 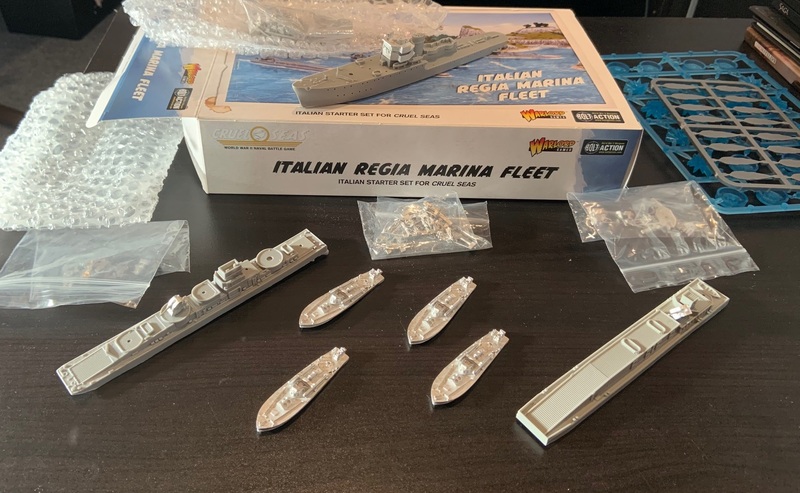 I’m also going to have to wait until they release the CRDA 60s as separate blisters as well, and that might be a while away, which is why the Italians are my second flotilla to put together.